Once upon a time, everybody had a Civic or at least knew someone who did. It was the family icon, the car that struck a familiar chord in the automotive landscape, and you couldn’t really go anywhere without spotting one. 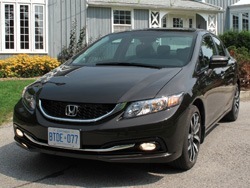 Canadians loved the Civic and was subsequently the country’s best selling car for nearly twenty years running. Since its inception, it stood on the pedestal as the deity of affordable and cost-effective compact sedans but in recent years, dreary styling and rushed revisions have turned the Civic into a bland and austere vehicle that relied more on customer loyalty and brand image than what lay under the sheetmetal. However, the new tenth-generation Civic promises to rejuvenate life back into the nameplate. We were given the keys to a brand new 2016 Honda Civic EX-T for only a few days, but 72 hours was all it took for us to cement a firm opinion about it. Reworked from the ground up, the new Civic reinvents the norm and is one of the best cars we’ve driven all year. Sitting on an all-new platform, the new Civic is not only longer and wider than the outgoing model, but the wheelbase has been stretched by 30-mm and the roofline has been brought down for a coupe-like appeal. The profile is more aggressive and sleeker lines put its vapid and conservative past behind. 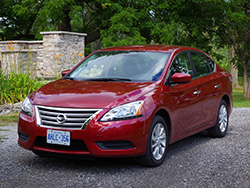 The front grille is a little messy with chrome and flashy bits, but the rear C-shaped taillights steal the show. Unique and handsome are two words that you’d never find in the Civic’s dictionary – how times have changed. Even my parents have to agree that the new model is damn good looking. We love this particular paint colour on our tester too (Lunar Silver Metallic) – not your boring rental silver but with a blue-ish moonstone tint. Looks expensive. Inside follows the classic formula of function over form, but Honda has managed to piece together the puzzle for a minimalistic yet attractive cabin. The new steering wheel grabs all the attention, and is wrapped in a chunky piece of leather that feels wonderful when gripped. 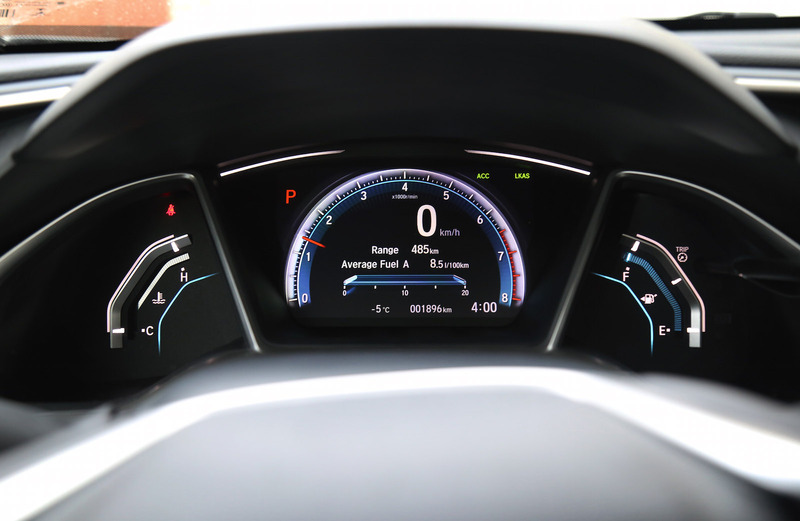 Honda has also implemented a serrated-kind of volume slider on the wheel that has earned much praise from our team. 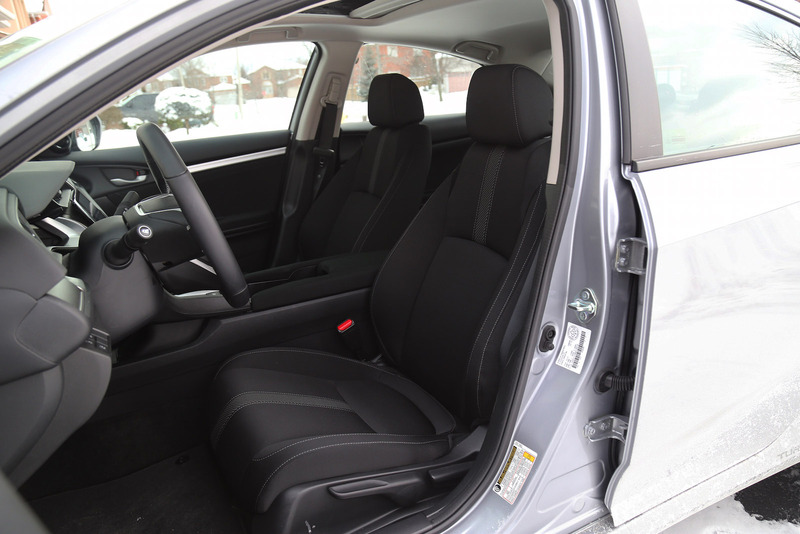 The seats, though cloth on our EX-T, were comfortable, heated, and provided a significant amount of bolstering. In the winter months, cloth seats don’t get as cold as the leather ones either. The infotainment system has also been slightly revised and ditches the dual-tier setup. Android Auto and Apple CarPlay is available, as well an electronic parking brake and a massive center console unit. There are now two engine choices for the new Civic buyer: a 2.0-litre four-cylinder engine pumping out a healthy 158 hp and 138 lb-ft of torque, and a more powerful 1.5-litre turbocharged four-cylinder that delivers 174 hp and 162 lb-ft. The naturally aspirated engine is available in all of the base trims: DX, LX, and EX, while the turbocharged engine is only available in the top trims: EX-T and Touring. 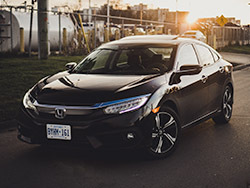 The turbocharged engine is the way to go, even though it’s a significant departure from the turbo-free high-revving Civic engines of the past. 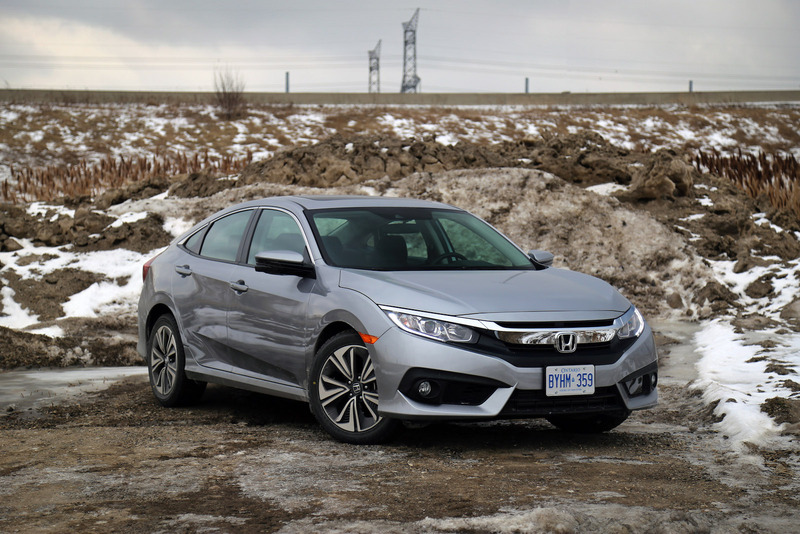 For such a small sedan, the Civic quickly picks up speed without much lag and once the turbos kick in, you’ll be hitting the speed limits without much fuss or droning – don’t expect to hear any blow-off valve noises though. The DX and LX trims can be had with a manual transmission, but anything above that is exclusively had with a Continuously Variable Transmission. As far as CVTs go, it’s not a bad transmission at all and diligently keeps the turbos at peak boost. The steering feel has got to be one of the best features of the Civic, utilizing an electric dual-pinion rack with a variable steering ratio. 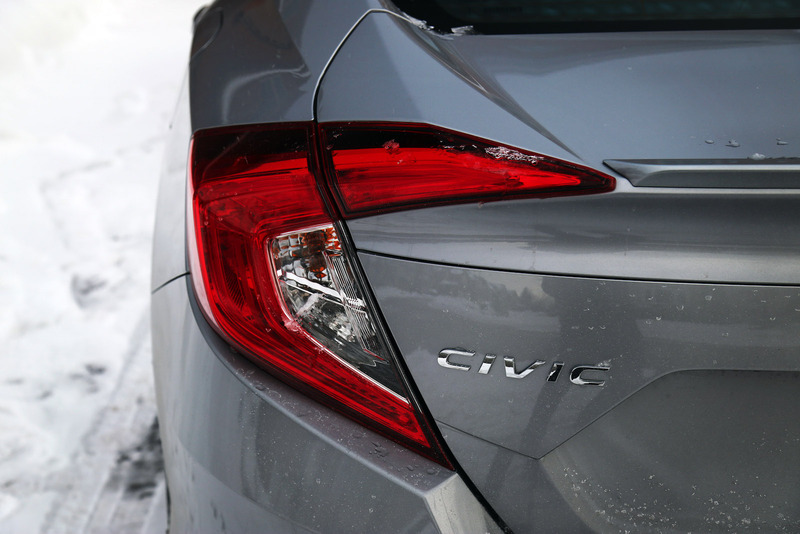 The directness and sensitivity to road conditions make the Civic very easy to drive and beginner-friendly. In fact, I’d take it over a BMW 3-Series’ bland electric steering feel any day of the week. Though the ride is a bit noisy, there’s nothing too intrusive to the commute. The suspension is soft and soaks up the undulating roads without breaking your back. If we had to buy a Civic (and we would) and choose a configuration, it’d be the EX-T model you see here. Loaded up with the admirable turbocharged engine, 17-inch wheels, a deck lid spoiler, fog lights, a leather wrapped steering wheel and all of Honda’s safety technologies such as: Forward Collision Warning, Lane Departure Warning, Road Departure Mitigation, and Collision Mitigation Braking System, it’s quite a steal at just under $25,000. The top-end Touring trim will push the Civic as close as it can be to an Acura. Leather seating, heated rear seats, navigation, wireless phone charging, and a host of other premium features put the sticker $2,000 more than the EX-T. Regardless of the trim, the Civic is a great beginner’s car, a great family car, and a great valued car. While the last model bordered on tasteless inside and out, this new iteration puts the benchmark higher to where a compact sedan could, and should be. Some people were surprised when the new Civic recently won the 2016 North American Car of the Year Award. We certainly weren’t.